The black Samyang Reflex 300mm f/6.3 ED UMC CS Lens is a mirror lens designed specifically for use on Sony E mount cameras. The lens' Cassegrain design enables it to achieve a 450mm 35mm-equivalent focal length perspective within a compact and lightweight lens design that is significantly smaller than a traditional 300mm lens. It features a fixed f/6.3 aperture and manually focuses as closely as 2.95'. 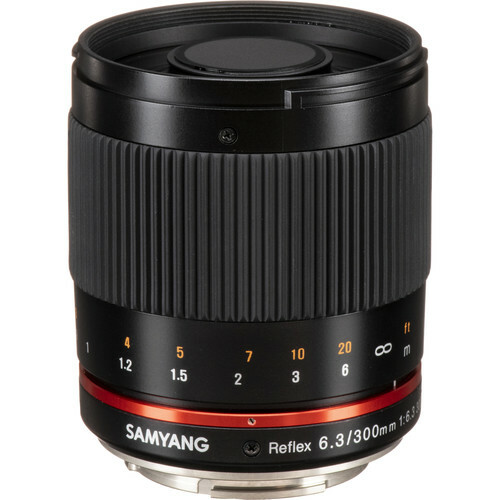 One extra-low dispersion element and the inherent mirror construction of the lens work to eliminate chromatic aberrations while providing notable image sharpness and clarity. Furthermore, the UMC (Ultra Multi Coated) coating has been applied to reduce surface reflections, lens flare and ghosting while also contributing to improved overall contrast. Mirror lens designed specifically for Sony E mount cameras. Catadioptric system with Cassegrain design helps to reduce the overall size of the lens while still providing a 35mm-equivalent focal length of 450mm. One extra-low dispersion element and a UMC coating are integrated into the lens construction to improve sharpness and clarity as well as enhance the overall image contrast. Box Dimensions (LxWxH) 7.1 x 5.4 x 4.1"
Reflex 300mm f/6.3 ED UMC CS Lens for Sony E Mount (Black) is rated 3.8 out of 5 by 4. Rated 5 out of 5 by GG from Compact, light and sharp My first impression upon unpacking this lens was to realize how small and light it is. Then I was impressed by how smooth the focusing ring was, without stickiness or backlash, a must for this kind of lens. Once I got enough practice focusing with it, I was impressed with its sharpness. Make no mistake, you will need practice: depth of field is quite short and focusing is a real exercise in finesse. But once you get there, the results are quite rewarding. The weakest point of this lens is its apparent vignetting, but if this bothers you, it is easily fixed using image processing software. Rated 3 out of 5 by Brad from Limited use lens I would give it 4 stars for build quality. 5 stars for light weight and compact size. Razor thin focal range and very low contrast images, requiring software processing to make the rare shot that is not blurry, usable. Slightest touch or bump will shift the focus. I will definitely keep this in the bag for limited use, for times when nothing else in my bag will work. Like most mirror lens, it is very difficult to focus accurately on moving objects and unlikely to have a sharp image while hand held. However if you shoot a high number of images, use 1/2000 or faster shutter speed, 1 in 50 shots of moving objects are usable and perhaps 1 in 3 shots of still objects from a tripod are acceptable. Not likely I will print or publish anything taken with this lens, but it can be useful for images that are used more for informational purposes, i.e. wildlife study, documenting vehicle movements, detective work, etc. Rated 4 out of 5 by Spider Legs from A fine telephoto lens I purchased this lens for bird photography, and I'm very pleased with it. It's compact, well-built, and fun to use. Once you've found focus the images are sharp across the field. I recommend that your camera have focus peaking to get the most out of this lens.